Creative Ideas app for Windows 8 is available under ‘Productivity’ section of its app store. 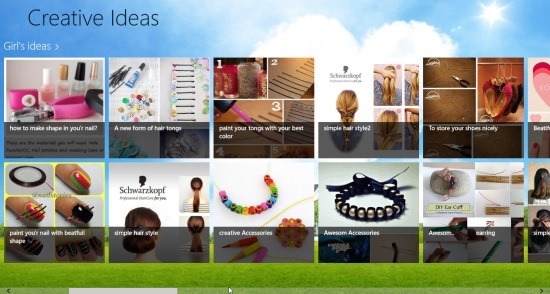 This Windows 8 creative ideas app brings you a collection of creative and innovative ideas to recycling waste materials available at your home to make new unique things. You can learn making beautiful bracelets using waste products, get ideas to make new things using waste plastic bottle, items which you can make using waste cartons, learn to be creative in food, clothes, etc. Reusing waste materials is a wonderful way to dump on your art & craft expenses along with saving the environment. You can also test your creativity level and try to make beautiful items out of every single waste product you find around you. Below given are the main features of creative ideas Windows 8 app. Brings you a collection of creative and innovative ideas to recycling waste materials. The waste materials available at your home can be utilized to creative new things. You can learn making beautiful bracelets, get ideas to make new things using waste plastic bottle, items which you can make using waste cartons, learn to be creative in food, clothes, etc. Lets you cut on art and craft expenses. Lets you explore your creativity. Well… I really liked the creative ideas Windows 8 app that lets you be creative and show your creative to your family. They would surely feel proud to see you making use of waste materials. You can find the app under ‘Productivity’ category of Windows 8 app store. It’s really easy to download Creative Ideas app in Windows 8. Also, check out our posts on Painting Apps for Windows 8, and Photo Editing Apps. Open the link in IE10 and click ‘View in Windows Store’. Now, you can move ahead with further installation steps to install the app. In short, Creative Ideas is a good utility app where you can learn to make innovative things out of the waste products available at your home. Go ahead and download Creative Ideas app in Windows 8 now.